• Snow plowing is a time consuming operation. 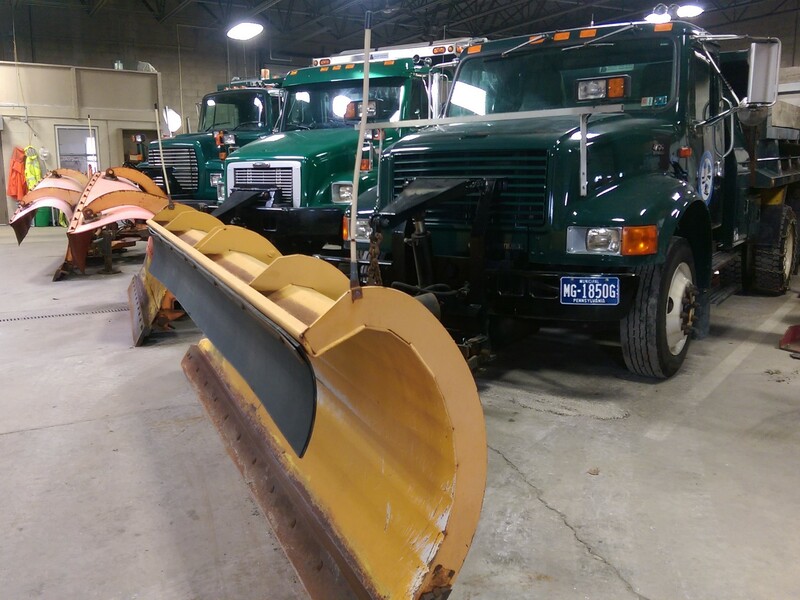 The East Donegal Township road crew consists of three full time and one part time employees. The Township also has subcontracted help with specific areas/developments. Depending on the amount and severity of a snowstorm, it may take a significant amount of time and effort by this crew after the snow ends to plow the roads. Please be patient! • The order of snow plowing streets is as follows: main roads, secondary roads, side streets, developments and finally, alleys. Curb to curb plowing requires two to three passes per side on most streets. • Please utilize ALL OFF-STREET PARKING if it is available. This aids our plow drivers. • Driveways or parking spaces which may have been cleared immediately after a storm and before the Township trucks get to that street or finish on that street, MAY BE PLOWED CLOSED LATER! It is not the Township’s responsibility to reopen driveways. • Mailboxes are on the right-of-way. If mailboxes are damaged by snow, slush or ice discharge from the plow chute (and not actually hit by the plow) it is the property owner’s responsibility to repair. Mailboxes and support posts should be structurally sound enough to handle any plowing conditions. • Sometimes, on uncurbed streets and in developments, lawns may be damaged from plowing, if not marked properly. It is the property owner’s responsibility to mark with posts or reflective markers within one foot of the roadway. After a few inches of snow, it is almost impossible for the plow operators to tell where the road ends and the grass begins. Along open sections or curves, where there are no visible objects (mailbox, poles, fence, etc) markers should be placed. • Do not shovel or blow snow into the street! The crews work long hours clearing the roads. Please follow these guidelines and be patient during snow removal operations. This practice may cause street freezing and create hazardous road conditions. • Do not follow too closely or pass plow trucks. Be aware of trucks turning around or backing up during snow clearing of intersections. • If you have a fire hydrant located on your property, shovel the snow away from it, so that firefighters can quickly locate it in an emergency! If you don’t need to drive, please don’t. The less traffic there is on the roadways the safer it is for everyone.